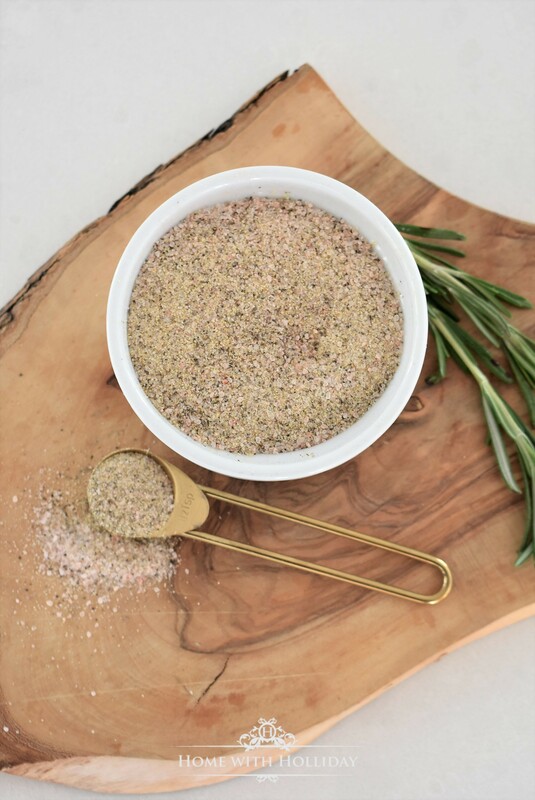 Since the holidays are over, I have plans to share several recipes with you in the coming months, and my house seasoning is a fundamental part of most of my recipes. The ingredients are so typically used in most savory recipes and in similar proportions. In my years of tweaking this recipe, here are my findings. Instead of Kosher salt or iodized salt like other recipes call for, I have settled on using Himalayan Pink Sea Salt for several reasons. For centuries, Himalayan fine sea salt has been used as remedies for a variety of health issues. Sea salt is known for its healing properties and is used by health professionals, spas and individuals who are interested in utilizing natural products to heal the body and relax the mind. Stimulating circulation, lowering blood pressure and removing toxins such as heavy metals from the body are just a few of the many benefits of Himalayan Pink Sea Salt. It also contains up to 84 trace minerals and iron. A very healthy choice! It is important to choose a fine grain of the salt rather than a course ground salt. With regard to the pepper, I use a fine grind rather than a table grind. The texture works better with the fine grain of the sea salt. For the garlic, I have found that garlic GRANULES works better than garlic POWDER. It balances better with the textures of the salt and pepper. These are the products I used for this recipe, but when I make larger batches of my house seasoning, I typically buy my supplies from Costco or Walmart in bulk, which is even more economical. This is my spin on Paula Deen’s House Seasoning that I have been using for years. It is perfect for seasoning poultry, fish, meats, vegetables, eggs, dressings and more. Mix all ingredients together and store in an airtight container for up to one year. I keep a ramekin bowl filled with my Holliday’s House Seasoning right next to my stove and near my other condiments on my counter for easy access. This way, I am not having to pull out my salt, pepper and garlic powder every time I am cooking. Easy peasy! Thank you so much for sharing this Holly! I am very interested in using the seasoning…what do you add this seasoning to or in place of? It is a combination of salt, pepper and garlic powder in the right proportions for typical savory recipes. I use in almost every recipe that calls for salt and pepper! Give it a whirl! Thanks for sharing the recipe! Love that you are going to share some of these this coming year! This looks like the perfect “all seasoning” for the pantry! I am making some tonight to keep on hand!!! Excellent, Jamie! It really makes things so easy rather than having to pull out these ingredients that are included in most savory recipes! I hope you enjoy it…the Himalayan Sea Salt is the key! Oh this looks absolutely yummy and will be on my list to make!!! Thank you for sharing. Thank you for sharing this seasoning mix! I cannot wait to try it! Hi Mansa, I think you will appreciate how easy it makes things! Plus, it is so easy to make in bulk! Thank you for stopping by! This seems so simple to make, but I’m sure it packs a lot of flavor. thanks so much for sharing Holly! Homemade seasoning is the best! I’d like to try this and keep some on hand. I highly recommend it! It also makes it easy for my kids if they are trying to cook something simple since they don’t have to pull out all of the elements separately! This is such a great idea! And a huge cost savings… Thanks Holliday! Excited to try it. I love the recipe, also love that you have a button to jump right to the recipe at the top. I wish more people would do that! Also love your pin labels. Do you add that beige heart as part of the image or us that a plugin of some sort? Hi Gail! My pin labels are added automatically by a plug-in called “jQuery Pin it Button” and it is easy to set up. Thanks for stopping by and I am so glad you liked the recipe. Give it a whirl! You are so welcome, Laila! It cuts down so much time for it all to be pre-mixed! Have a great day!! This would be good on absolutely everything! Right, Jane?! We use it every day for sure! I am definitely making this for my Bunco group. Everyone usually goes home with a little gift. This will be perfect! Oh, how fun! What a nice idea. They will love it!! Great seasoning! Where did you get those darling little jars? Believe it or not, I bought them at Hobby Lobby at 50% off for only $1.00 each!! I also linked a few similar options in my post, if you would rather order some online. Thanks for stopping by!